When I asked Princess Jones to be my guest co-host for the podcast for her third time, I expected it to be a fun episode. But when we ultimately decided to talk about dealing with fear and confidence issues, honestly I thought it would be much drier than our previous shows together. Not so! Leave it to Princess to bring the fun. She had me laughing most of the way through this nearly hour-and-a-half show (shorter version available as well). The most basic takeaway of this episode? If you ever face fear or a lack of confidence as a writer, know you're not alone No matter how experienced we become, every writer deals with these issues at some point or another. 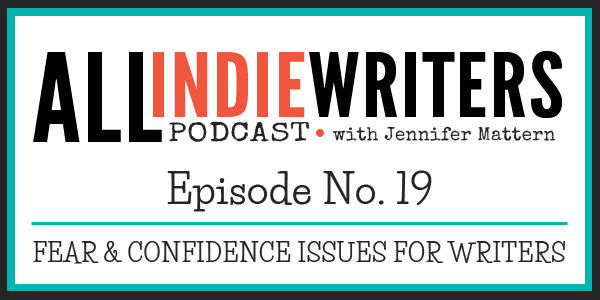 Princess and I share some of our own crazy fears, how we cope with them, and offer some tips on being (or faking) confidence to get ahead in your writing career. My chat with Princess ran much longer than anticipated. As such, we decided to release a special extended cut with approximately 20 extra minutes of content. If you want the full experience, you can listen to that here. Or you can find the standard version that went out over the iTunes feed at the end of the show notes. Disclaimer: It's the official All Freelance Writing position that you should not lie in the pursuit of freelance clients. At all. No matter what Princess says. She's crazy. Below you'll find a picture of Princess' "Yolander Prinzel puppet" discussed in the episode, along with an explanation from Princess. Thank you to Princess for her sheer craziness in creating this thing, and to Yo for agreeing to let me share it here. "I made this little puppet because I often go to Yo to ask questions I already know the answers to. Like "Should I give up my freelance career to work on fiction because I like it more?" Or "Can I call myself a 'bestseller' in my book copy because I was on the Amazon bestseller list for like 10 minutes?" And Yo i generally very blunt with me and says "No" to all of my crazy ideas. When I realized I was asking questions I already knew the answer to, I figured I'd cut out the middleman and make myself a little totem that I can talk to instead of bothering her. I pretty much take it everywhere I go. In my home office, on-site to meet with a client, on vacation, etc, etc. As for the picture, Yo tends to send me aggressive orders to be nice to myself or to eat well or to believe in myself. I have an Android watch so when she sends me messages, they appear on my watch with her face behind them in a very Wizard of Oz fashion. 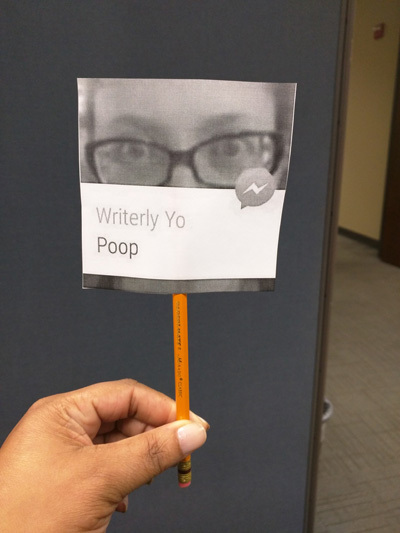 When I told her this, she sent me a message that said "Poop." I took a screenshot of the picture and she used it as her avatar for a while. And that's the picture I chose when I made my Yo puppet." You should also check out a follow-up video referencing this podcast episode. Jake Poinier (of DoctorFreelance.com) talks about impostor syndrome and freelance creatives. Boy, this was an informative interview. I like the idea of asking curious questions when pushing for a change because they are non-threatening and open up the space. By the way, are you open to interview requests? I’m an author of an upcoming memoir and frequently podcast around the benefits of blogging one’s book as a way to build one’s platform. Unfortunately right now I’m not lining up interviews for the show. I don’t actually do interviews but rather bring on colleagues — generally ones I know pretty well — for more casual conversations about issues we’re both passionate about. With the folks I just had commit plus a few I need to hear back from for a special series I’m doing, my guest co-host spots are actually booked through early fall at this point, and I already have a few other colleagues I plan to approach after that. So this year’s pretty much booked (time’s going to fly, that’s for sure!). If you blogged your own book, even though podcast is fully-booked, I’d be open to doing an email interview with you or something for the blog here instead (which also goes out to email subscribers). If anything, the blog has more reach than the podcast for the time being. 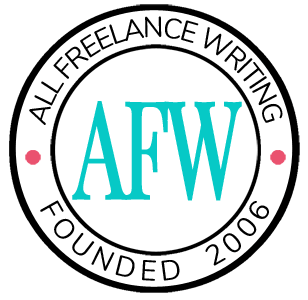 If you’re interested, email me some of your background on how you went about blogging your book – jenn@allfreelancewriting.com.